Is taste really enough anymore? Regardless of your answer to this question, it is certainly one which the nostrel-savvy founders of the innovative company Molecule-R would answer with a resounding NO. The AROMAFORK is a new, and slightly crazy food invention and is a result of extensive research into the complex workings of the nasal passageways. With this device customers can experience an abundance of flavored scents even more intriguing than the invention itself. 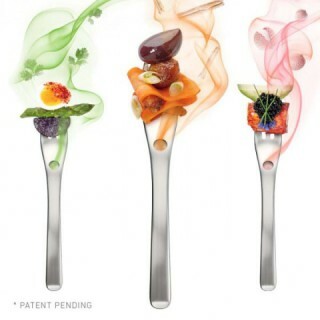 The AROMAFORK is a modern day utensil which, in addition to holding your food, also emits flavored vapor, giving users a unique eating, and smelling experience. Offering a variety of scents, both savoury and sweet, the flavor-focused folk over at Molecule-R base their concept around the fact that we are able to taste only five primary tastes, whereas our sense of smell is able to identify much more subtle flavors. As so eloquently explained in the video below, The AROMAFORK seeks to offer you additional flavors as you enjoy a normal meal. Whether you want to taste chocolate alongside your vanilla ice cream or have forgotten to add mint to your dish, you can simply add the desired flavored liquid to your AROMAFORK before sitting back and enjoying the experience. The AROMAFORK is only one of Molecule-R's many products, and with this innovative and inventive company going from strength to strength, there are sure to be many new crazy inventions on the horizon. I mean what's next? Changing the texture of cocktails? Oh wait, they are actually doing that too. So what are the potential downfalls of this pongy product? Well, there are certainly many who, following a hard day's work and and carrying around an empty stomach, would not be interested in filling a futuristic-looking fork with scents of their choice before tucking into dinner. There may also be those who do not see the point in purchasing something which offers lovely aromas while lacking on the nourishment side of things. Well from my point of view, I would give it a whiff in a heartbeat. 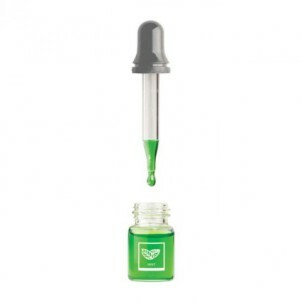 Should you wish to test the vast possibilities of the body's nasal network you can purchase the AROMAFORK, as well as many other products here. Included in the kit is the following: 4 AROMAFORKS, 21 selected aromas, 4 droppers, 50 diffusing papers and, oh yes, one multi-sensory evening program. So let us know if you give this crazy little bit of kit a go!